Born in Sofia, Bulgaria in 1958. He holds a MSc degree in Molecular Genetics from the Faculty of Biology, Sofia University "St. Kliment Ohridski". Since 1983 he has been working as a research fellow at the Institute of Molecular Biology at the Bulgarian Academy of Sciences. In 1994 he has obtained his PhD degree in Molecular Genetics. Since 2004 he is an Associate professor and Head of the Laboratory of Molecular Genetics at the same institute. Doctor Miloshev is a professor in Molecular Genetics since February, 2018 and is currently involved in the management of the research work in the laboratory. Chromatin structure and dynamics, especially at the higher order levels of organization. His scientific interests and research efforts are aimed at gaining deeper understanding of general cellular mechanisms specifically about epigenetic phenomena. The intention of his work is acquired information to be used for practical purposes in medicine, criminology and ecology. Born in Kyustendil, Bulgaria in 1977. She holds a M.Sc. degree in Cellular and Developmental Biology from the Faculty of Biology, Sofia University "St. Kliment Ohridski", Bulgaria.She has completed her PhD in Molecular Biology at the Institute of Molecular Biology, Bulgarian Academy of Sciences in 2009. The title of her PhD is “Structural and functional significance of linker histone Hho1p for Saccharomyces cerevisiae chromatin.” Form 2010 to 2016 she has been an Assistant professor at the Institute of Molecular Biology, BAS. She is now an Associate professor at the laboratory. 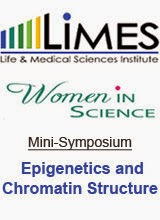 Her current work involves investigation of the interplay between chromatin remodeling complexes and linker histones during normal development, ageing and age-associated diseases. ■ Stem cells: Epigenetics and Molecular Biology. Chromatin structure and core histone bivalent post-translational modifications as determinants of stem cells’ fate. Born in Sofia, Bulgaria in 1968. She completed her Ph.D. in Molecular Genetics at the Institute of Molecular Biology, Bulgarian Academy of Sciences. Thesis title: "Isolation and characterization of KlSEC53, KlPSA1 and KlPCL1 genes, related to the protein glycosylation in Kluyveromyces lactis". Since 2006 works as a Postdoctoral fellow at the Institute of Molecular Biology, Bulgarian Academy of Sciences. Her current work involves examination of chromatin organization in yeast Kluyveromyces lactis and studies on the role of linker histones H1 using K. lactis as a model system. Her interests go further in research to unravel the sensitivity of dairy yeast K. lactis towards genotoxins. She is involved in a project working on a Drosophila model of fragile X syndrome and an investigation on YKL-40 protein as a biomarker in tumor and degenerative diseases. Dissection of chromatin structure and function; highlighting in vivo activities of chromatin remodeling factors; yeast as a model system for linker histones research. Born in Plovdiv, Bulgaria in 1984. She now holds a MSc degree in Genetic and Cellular Engineering, obtained at Faculty of Biology, Sofia University “St. Kliment Ohrdiski”.Since 2008 works as a research fellow at the Institute of Molecular Biology, Bulgarian Academy of Sciences.In 2012 she has started a PhD studentship in Molecular Biology at the laboratory of Yeast Molecular Genetics, IMB – BAS. Her current work involves examination of mutation rates and population’s genetic diversity in Taraxacum officinale plants collected from heavy metal polluted areas.Her interests go further in research toward detailed studies on plant epigenomic changes during stress response and adaptation. Born in Gabrovo, Bulgaria in 1993. She holds a BSc(Hons) degree in Molecular genetics from the Faculty of Life Sciences and Medicine, King’s College London. Her Bachelor degree included the writing of two theses - Epigenetics and Ovarian Cancer, as well as, Introduction of a Single Amino Acid Mutation in Catechol 2,3-dioxygenase From Pseudomonas putida. She was also a part of the Genetics Society at King’s College London. She graduated as a MSc in Cellular Biology and Pathology from Sofia University, Faculty of Biology, Department of Cellular Biology and Pathology and now is a PhD student at the laboratory. Her current work in the lab is in the field of Genetics and Epigenetics of ageing. Bela has interests in Cancer Biology and Epigenetics, along with Stem cells.